Liz is a trusted advisor and tireless advocate. 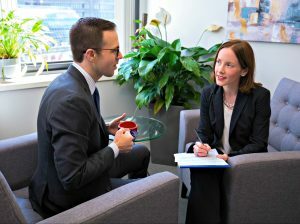 Whether litigating a complex dispute or providing advice aimed at helping a client avoid the courtroom altogether, Liz learns her clients' strategic priorities and partners with them to achieve their goals. Elizabeth Monnin-Browder (“Liz”) is an experienced business and employment litigator who is driven to achieve results. She represents companies and non-profits in complex disputes across a broad range of industries, including health care, higher education, technology, and financial services. Liz applies strategic thinking, creative problem-solving, and exacting attention to detail to all phases of a lawsuit. 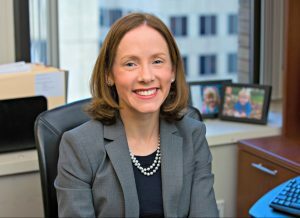 She understands the business implications and human impact of litigation, and works hand-in-hand with her clients to craft a strategy that is consistent with their priorities and advances their goals. Liz represents clients in state and federal court, including before the Business Litigation Session of the Massachusetts Superior Court and the United States District Court for the District of Massachusetts. Liz also provides thoughtful, practical guidance to help her clients avoid litigation. Liz has worked with clients to analyze and mitigate risks associated with business opportunities. She has advised clients regarding compliance with new laws and best practices in their industry, and helped them design and implement new policies. Liz has also conducted internal investigations for clients in response to inquiries by foreign and domestic regulators. Liz draws upon her experience working in the Massachusetts State House, as well as her graduate degree in Health Policy and Management. Liz has a passion for civil rights, and, in particular, transgender rights, and has written and presented extensively on the topic. Prior to joining Hirsch Roberts Weinstein, Liz was an attorney in the business and securities litigation department of Ropes & Gray LLP where she represented sophisticated clients in complex business and employment disputes. Immediately after graduating from law school, Liz spent a year as a staff attorney at GLAD, where she worked on impact litigation and co-authored and co-edited a family law practice guide titled Transgender Family Law: A Guide to Effective Advocacy. Prior to law school, Liz worked as a legislative aide in the Massachusetts State House while pursuing her Master in Public Health degree in Health Policy and Management.